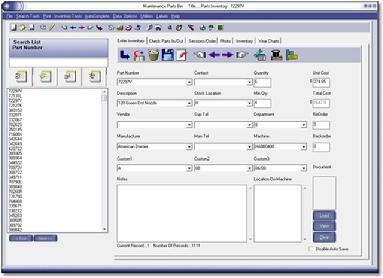 Maintenance Parts Bin is a comprehensive parts inventory software system. You can maintain your parts inventory as well as databases in the most cost effective and suitable way.The primary functionality is stock control, cater to reorders and parts management. Secondarily, this tool allows you to customize an existing database title or creates new ones to suit your requirements. The administrator is the sole person entitled to edit a database. A password prevents unauthorized duplicating, editing or deleting. You can choose the default database to be loaded on startup. It manages parts, scans barcodes, and prints records.You can retrieve any record by entering a record number, using Text Search or the search list boxes on the left of the form. The usability of the GUI can be rated as excellent and has changing skins option. MPB allows you to track and control all inventory, including minimum and maximum reorder points, custom reorder points, inventory levels, inventory tracking, purchase orders, vendors and much more. MPB records sessions of all items moved in or out of inventory. Maintenance Parts Bin is a single application with multiple functionalities which could incorporate seamless integration into your maintenance management software and spare inventory management software. Unique sliding window design makes printing barcodes, labels, creating Purchase Orders, Invoices easy. Suitable for hospital inventory, aircraft, automobile, wood shops or any place that needs to track and manage inventory. We suggest you familiarize yourself with the Hoverwatch software that has been developed by our partners. When you use this product in conjunction with our solutions, your efficiency will increase because of your greater control over the activities and location of your staff.